House Fire ! Have I lost my home? I can guarantee that every day in South Australia there is a fire in a home. Some of these result in the fires that we hear about on the evening news while others are small fires, often while cooking, which are extinguished without the involvement of the Fire Service. 1 / It won’t happen to me. While the chance of a fire happening to you is rare it is guaranteed that each day it happens to at least one person in South Australia. We enter the lottery on the hope of winning, in reality you are more likely to have a fire than win the lottery, so don’t gamble with your home. 2 / If a fire occurs in my home the Fire Service will be able to extinguish it without damaging too much of my home. 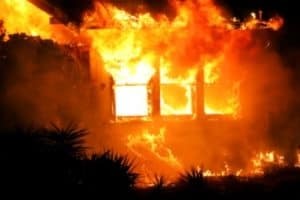 At the national Fire Australia conference earlier this year a presenter from UL showed the video of how quickly a fire in a modern home gets out of control, refer to the video below. Within 3 minutes 30 seconds after the fire was started the room is uninhabitable. Considering the smoke alarm probably activated between 1 minute and 1 minute 30 seconds after the fire started that is not very long to get out of the room – two minutes! But what about the fire service? The following table shows the progression of the fire compared to the corresponding response from the Fire Service. The speed that the fire grows will depend upon the cause of the fire, for example a candle knocked onto a couch will grow quicker than a cigarette dropped into the same couch. In the example below we are using the fire shown in the video. The Fire Service response times are based on benchmarks, often their response is quicker. 1 / The only way to save your home is to extinguish the fire quickly. 2 / You need to be responsible for getting all people and pets out of the home. 3 / The Fire Service will not save your home, they will protect other people’s homes. To be alerted of a fire as soon as practical you need to have working smoke alarms. These smoke alarms need to be interconnected, so when one is activated they all sound an alarm. The Building Code of Australia only requires smoke alarms in a home to be installed in hallways and other rooms that are paths of travel from a bedroom out of the home. If you want to ensure your safety also install one in every bedroom. It is important to remember that people with hearing problems and young children may not wake when the smoke alarm is activated, you may have to go and wake them yourself. You need to be able to extinguish the fire, this is best done with a fire extinguisher and a fire blanket. 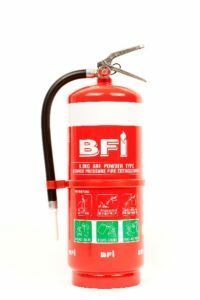 We recommend a general purpose ABE Dry Powder fire extinguisher of at least 1kg capacity, preferably larger – its better to have more than not enough. 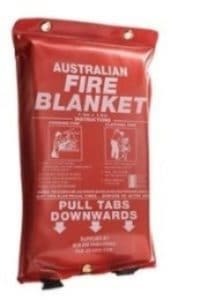 The fire blanket should be at least 1m x 1m . You would be better with 1.8m x 1.2m as this can be used on clothing fires. Once you have this fire equipment make sure you know how to use it. Most workplaces undertake fire warden training, why not volunteer for this and get them to train you on how to use a fire extinguisher and fire blanket – it might just save your home! If there is a fire in the hallway how do you get out of your bedroom. Where do we meet? How do we know if everyone is out? It is also worth rehearsing. When we are in a high pressure situation we forget 99% of what we know, if you have rehearsed hearing the alarm and getting out of the house then you are more than likely to respond correctly. So plan ahead and be able to save your home from fire or be able to get out safety. Remember you can rebuild a home but you only have one life.